It’s always sad when a bird dies colliding with a clear glass window. This tends to happen fairly often in urban areas and has been known to occur at people’s homes as well, especially during the Spring and Autumn migrations. No one knows exactly how many birds are killed this way, but annual U.S. estimates are in the hundreds of millions. 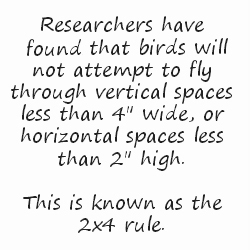 When designed according to the 2 x 4 rule, (see boxed out text) patterned films can be effective at preventing bird collisions. While they interrupt reflection for the birds, they can also create interest and preserve a degree of visibility for humans. 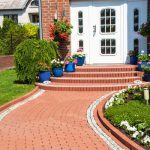 Researchers are testing the effectiveness of different pattern densities, configurations, and colors. One thing we know for sure: patterns applied to the inside surface of double-paned windows won’t be effective if not bold enough overcome reflections of the outer window pane. If designed densely enough, custom window graphics used for branding and street activity can conveniently bring marketing and bird-friendliness together. 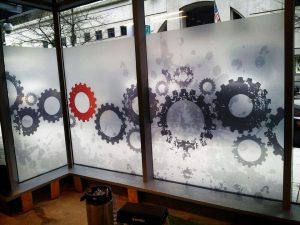 The gear graphic here is paired with a frosted film for added privacy, which will definitely obscure any reflections. If more gears were used, they alone could distort the glass enough to deter birds from striking the window. Making your windows completely opaque by applying a film that mimics etched, stained, or frosted glass is an excellent way to reduce or eliminate bird collisions. 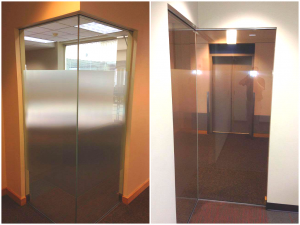 Rather than replacing your windows with expensive specialty glass, installing a film will be a much simpler solution and save you thousands of dollars. A new line of film we suggest for you in is called Lumisty. At certain angles from the outside, lumisty makes your windows look opaque (deterring the birds), while from the inside your view remains clear. This is a great option if you have a high-rise view you don’t want to obstruct. 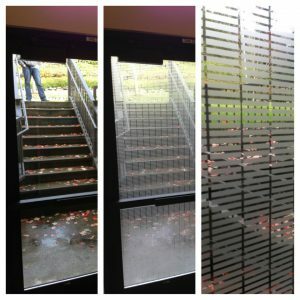 Contact Pacific Window Tinting today to discuss your many options in window film. Send us an email or call 503-736-9000. *Our window films are not guaranteed to prevent birds from striking your windows. More official research must be done on this topic before any window treatment proves to prevent 100 percent of collisions.